1.) As hoss said, the object in question first needs to be visible, secondly it needs to be selected. Once selected the rest of the options in the menu will be there. 2.) For textures on the right of the drop down menu where you select the mode (Object, Edit, Pose) is a smaller drop down menu. In that menu you can select the display type one of which being Textured to see the texture on the model. This doesn't work 100% of the time depending on the model but won't work in other 3d programs all the same. On the tab below these drop down menu's on the far left is a widget called " Links And Materials ". The material name for the selected object is listed there as well as any other relevant information about it. Manipulation of the texture is past me here in Blender as I use a different program for texturing myself (I like the features in Milkshape better). 3.) Correct. As you do this the male basic (or whichever) mesh will move (pose) as you move the bones. What your actually doing here is using that system to line-up the vertices from the male basic with the new object so that the weights from the vertices can be copied where they'll need to be. So your lining up the hands from the male basic with the new mesh, the arms, the feet, the legs and so on. Blender then examines what's lined up with what so it knows what sections of the new mesh are supposed to be aligned to what bones of the male basic one. The position of the new mesh won't be retained in the final nif anyways as it will adjust back to whatever position the animation is normally in in game/Ctool. This is only used as a measuring stick for copying weights. Always remember to hit Ctrl+A before leaving Pose mode to assign the Current Post as the Rest Pose, else none of what you did will matter when you get to the weight copy part. Thanks SA, I found the "Links and Materials", so I'll give this another try, hopefully this weekend. Thank you both for being so patient with me. It really is appreciated. No thanks needed. I enjoy passing along anything that's been taught to me in turn. Especially knowing that down the road I'll see a result of it in your work. Not sure whether it fits here but I ran an experiment tonight and wanted to share and make a note of it somewhere. I did a multiple weight copy successfully tonight. It was rather rough but I believe this was because I didn't properly align the meshes as I just wanted to see if it was possible. Anyways to do a multiple weight copy go through the normal RD weight copy process. Before going to the copy step however select the multiple meshes you want to copy from. The Object > Join Objects (or Crtl J). Then copy the weights from the newly joined mesh and follow through the process as usual. That's it, easy peazy. My test was to make a single piece cape for Storm that both joined up at the wrists like the side capes do, fanned out the where the cape hangs at it's lowest point then back up to join at her midsection. So I joined the female bald, the side capes and cape into one mesh and copied from that. I can see where this will be a useful trick. Hi All, So I'm trying to get into Blander. I've been able to import a variety of file types, and thanks to your tutorial SA I can now weight the body parts properly, so they line up well and look good with keyframes. The biggest issue I have now is textures. I just exported one nif, but it won't even load up the texture files. I've pointed to them in Nifskope. and trying to mess around in Blender, I think I have the materials pointing to the right textures... but still the nif gets grayed out. completely! Any ideas to fix the textures? You might need to export it again, and check the paramaters. I exported one that didn't use either *.tga or *.dds. Ok, I've tried exporting a .obj into a .nif first without making any modifications, just so I could do the weighting and everything after. But still, all black, can't fix it. Is there a way in Blender to change the referring texture from a .png to a .dds or .tga? When you export a nif in Blender on of the checkboxes is to auto assign "dds". Uncheck that before exporting. Blender will remember your choice thereafter so you should only have to do it the one time. is there a fix for warped mapping? i've tried converting obj pieces like weapons and vehicles into nif files, and i've also tried importing obj files into the nif files, but then when i try to export wiremaps, i just get a big blob that doesn't work. does anyone know if there's a way around this? Unfortunately Robot, it pretty much seems to be a crapshoot. I've tried different versions of NifSkope, different ways of getting the (Obj.) into the (Nif. ), and sometimes it works, and sometimes it doesn't. I haven't figured out what makes the Textures work correctly yet. Hopefully someone better versed in either Blender or NifSkope will be able to answer this one. EDIT: I should state that out of maybe a dozen attempts, I've had 1 success. You have to manually remap them in that case in a 3d modelling program. Myself I do mapping/texturing in a different program (Milkshape) and then import my finished model into Blender so I wouldn't know the Blender process but I can't imagine it would be too difficult after reading a tutorial on the Blender site. This is probably an easy fix, but I can't seem to find it. I've gotten this error on a few of my exports now, but whatever this "Ka" is, I can't seem to find it. Would anyone happen to have any suggestions here? I've been having the Blacked Out NIF issue as well. If you're having the same problems that I'm having then I think I have the fix. If you look at the Trident that I exported, it has a second NiTriShape (Trident 1). Highlight that, and hit "Remove Branch", and it "Should" solve your problem. But that's assuming you're having the same issue I've been having. I hope this helps. And I know it's a given, but I have to say it anyway, don't forget to back up your work before making any changes to it. I hate to do this, but I'm going to give this one a bit of a "Bump" here. I still seem to have this issue quite often when trying export Static Meshes, which unfortunately, puts them at a halt. I know I have to be misreading something, but for the life of me, I can't figure it out. Would anyone be able to help me get past this? I would love to try my hand at reshaping meshes and such, but I'm technically challenged and a lot of this stuff goes right over my head. Never had that error. Have you tried hitting the "use defaults" button? Have you located texture KA? Does texture KA have an extension? I've had it export stuff with no textures listed. But then I could choose them and everything was fine. that's a fairly common error for some meshes. Pretty simple to fix. Here is a quick tutorial I made for adding Textures to meshes in Blender. Since you both are Mods on that Group, you should be able to make changes, add Files, Etc. as you see fit. I've been looking for Months, and on multiple Meshes. I still have no idea where to find "KA", or what it is. As soon as I have some free tome, I'll try DM's suggestions and see if that helps. KA only appears on some meshes. It depends on which methods the devs used making the meshes, or the way the ripper took and compiled the mesh from the game. I think it usually refers to an alpha layer in the mesh. As the Map To is usually set to Alpha, not Col.
Don't worry about it really, just delete it. And focus on gettingg the base texture to work properly. Hey DM, I'm sorry to keep bugging you, but would you happen to have any sort of instructions/guide/whatever for using the Autodesk FBX Converter to convert (.fbx) and (.dae) Files into (.obj) Files? Sure thing. I'll make one now for you. Just those three steps and it should work. 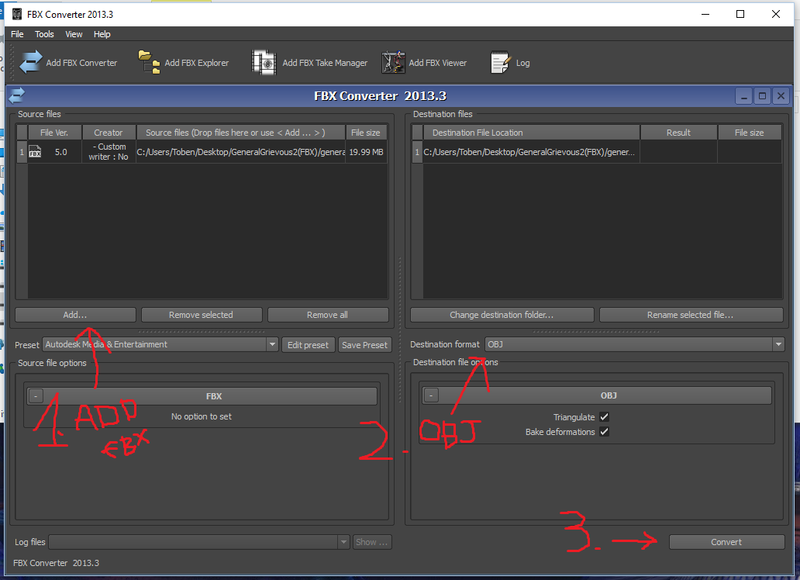 Add all the .fbx files you want to convert, select OBJ for the destination format, and click convert. I've done it about 50 times and never had any trouble with it. This is awesome DM. The FBX Files convert to OBJ without any problems at all. But for clarification purposes, I'm converting the DAE Files to FBX Format, and then converting those to OBJ Files. Is that right, or am I overthinking this? Oh thats right! you need to do the extra step for dae. I've only done that a few times. Yeah, it's pretty simple, converting like that. I was always worried about data loss though in all the conversions.... I wonder if there is any, I know i've had to normalize some meshes before, because they got a bit fuzzy, but I'm not sure if that was due to the conversions. Converting from (.Dae) to (.FBX), I've actually had a few issues. In some cases, I get an error message stating that the Mesh didn't convert, and in other cases, I get an error message stating something about there not being enough parameters. But for the most part, this is working out well. I really appreciate you suggesting this, and I'm even more grateful for the help you've provided with it. For those wanting to try experimenting with Blender, here's a very simple YouTube Video I found that show what you need to get started.